Men of Mystery #98 is now available!! This issue is devoted to the offerings from early comics pioneer Victor Fox’s Fox Features line, with sixteen rare stories from this legendary line. 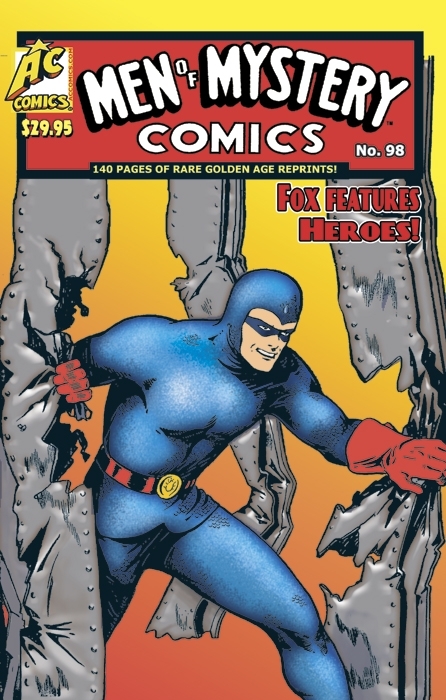 Cover feature The BLUE BEETLE is likely Fox’s best-remembered hero, and you’ll see him this issue not once but TWICE, in an early Golden Age appearance in a story from Mystery Men#13 (drawn by Larry Antoinette) and also one from late in the run, a 1948 Jack Kamen- drawn gem “Suicide For Sale”, from Blue Beetle Comics #53. Another star of the day was SAMSON, who also appears in a pair of tales- both drawn by Al Carreno- one each from Fantastic Comics #’s 15 and one from # 20. The GREEN MASK was BB’s co-star in Mystery Men, and he’ll likewise share the spotlight here, appearing in a tale (also from MM #13) drawn by the Cazeneuve brothers- Louis and Arturo. STARDUST the SUPER-WIZARD is one of the weirdest featiures ever to appear in comics, and he turns up here in a tale (also from Fantastc #15) where he calls upon help from “The Stardust Sixth Column”- a group of teenage boys (all decked out in costumes identical to his) to beat some racketeers- as only creator Fletcher Hanks could illustrate it. And we couldn’t do an issue of MOM without presenting at least a couple of costumed types that had never prviously appeared in reprints in the title, and this time around we have three! First. it’s The BLACK LION, from Wonderworld Comics # 27, along with his partner, The Cub, by Chuck Winter. I might surmise that the BLACK LION stories are unused episodes of The BLACK FURY (who previously ran in Fantastic Comics) slightly reworked. Then, there’s”DYNAMITE” THOR, from Blue Beetle #6. This costumed crusader works somewhat in the mold of Quality’s HUMAN BOMB or Centaur’s TNT TODD- he propels himself through the air and fights crime with the aid of-dynamite- though it’s not really clear just HOW. Finally, it’s The BANSHEE, from V-Man Comics #2. This early Warren King-drawn hero is actually mild-mannered Jim O’Connell who wraps himself up in tattered shrouds, and leaps about fighting crime and-screaming. Really. All this plus Fox’s underwater hero, NAVY JONES; LIEUTENANT DRAKE by Klaus Nordling; V-MAN by Ramona Patenuade; SPACE SMITH, Dr. Mortal (by Bert Whitman) from Weird Comics #8, Bob Powell’s D-13 and MARGA the PANTHER WOMAN. 140 pages of rare, early Golden Age hero action in black and white with color covers, for $29.95. Released in 2015.